For those determined to keep track of the Nashville Predators‘ active roster on a day-to-day basis, it’s okay to step back, take a deep breath and give the ol’ thumbs a rest from tearing through the Twittersphere. Through their first 45 games, the Predators have put 37 different players on the ice, more than any other team in the league. Only four skaters on the roster — Ryan Johansen, Filip Forsberg, Mattias Ekholm, and Calle Jarnkrok — have seen action in each of those contests, and with the injury bug becoming particularly vicious entering the new year, the team has seen the revolving door to their lineup reaching maximum velocity. Historically, a team built from the blue line out, the Nashville Predators now find themselves tending to a defensive corps stripped of its two All-Star caliber talents, yet finding ways to grind out success. The Predators have won four of their last five contests, only surrendering eight goals across that span — and it’s been a defense full of unsuspected names that has put their team north of the playoff line. 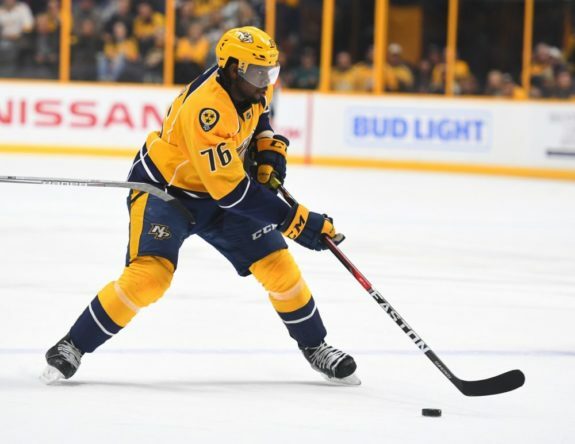 Entering the 2016-17 campaign, the hockey world was buzzing with the prospect of watching former Norris Trophy winner and brand new Nashville Predator P.K. Subban take to the ice with his new club. The idea was that head coach Peter Laviolette’s system, which hinges upon puck-moving defensemen activating up into the offensive action, would be a perfect format to unleash the full force of Subban’s talents. Early results, however, have been inconclusive … or, perhaps more accurately, are still pending. Subban hasn’t seen playing time in over a month, having been absent with an upper-body injury since Dec. 15. The former Montreal Canadians defenseman was able to prove his offensive adeptness early in the season, marking 17 points (7 goals, 10 assists) in 29 games. Good enough numbers to be voted captain of the Central Division’s All-Star team (aided, no doubt, by the player’s intense popularity), but still to be determined is whether his team-worst minus-11 rating suggests reason to be concerned about his effectiveness in the defensive zone. The Predators have a .948 5-on-5 save percentage in the 14 games that P.K. Subban has missed, tied for highest in NHL during that span. Nearly a month after losing Subban, elite-tier defenseman Roman Josi followed suit and was placed on IR after absorbing a five-minute major-inducing blow to the head in Boston. Despite the two rarely skating together, Josi’s Jan. 12 exit effectively ridded the roster of its top defensive pair. Squaring their shoulders to carry the bulk of the weight have been long-time Predators stalwarts Mattias Ekholm and Ryan Ellis. Ellis, hot off the heels of his first career two-goal performance in Calgary, has been donning the alternate captaincy for the defense, and the pair have been busy giving the franchise every reason to lean strongly towards protecting four defensemen in the upcoming expansion draft. 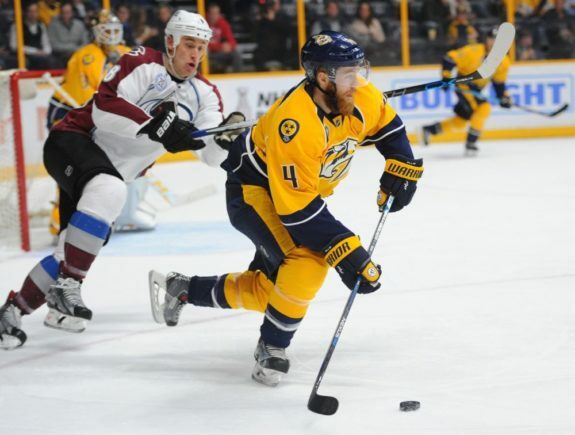 Behind Ekholm and Ellis lies one of the more intriguing storylines from the Predators’ campaign thus far — the play of offseason free-agent acquisitions Matt Irwin and Yannick Weber. Weber will of course always have the misfortune of not being the real Weber in Nashville, but he’s been serviceable in a second-pairing role since the departure of Josi — a stretch which has seen the Predators marking a 3-1-0 record (including the Boston matchup which Josi exited). What’s more, Weber has been a solid addition carrying a bargain-bin price tag, ringing in at only $575,000 against the cap. The real steal, however, has been former San Jose Sharks and Boston Bruins defender Matt Irwin. Entering the season with the same one-year contract as Weber and initially occupying a seventh/eighth defender role with the franchise, Irwin has excelled with each opportunity given and now finds himself rotating shifts on the top pairing of the Subban-less, Josi-less defense. A team-high plus-15 rating places Irwin fifth amongst Western Conference defenders in the plus/minus category, and his ice time has increased to right around 21 minutes a game with the depleted roster. Toss in three goals, five assists and a team-leading 83 hits, and you have the recipe for a contract extension — which is exactly what GM David Poile cooked up for the 29-year-old rearguard. Rounding out the defensive unit has required a bit of ingenuity and the tapping of numerous available resources. Second-year-man Anthony Bitetto, who played the entirety of the Predator’s playoff run last season, holds the most concrete position on the third pairing despite injuries limiting him to only 12 games on the year. Fellow sophomore Petter Granberg was at one time the heir apparent to the final roster position, but he too fell victim to being trendy and was placed on IR following the team’s 3-2 win in Colorado a week ago. With a vacancy left to fill, the Predators tried to find answers from both their AHL affiliate and the waiver wire. Twenty-year-old prospect Alex Carrier was called up from the AHL, where he had notched 22 points in 35 games with the Milwaukee Admirals and earned a slot on the AHL All-Star roster. With Granberg’s placement on IR, the promising Carrier got the nod to open up his NHL career, and now holds a plus-1 rating over the Predator’s last two contests. Yet to make an appearance in a gold jersey is defenseman Brad Hunt, the team’s latest waiver pickup, who undoubtedly qualifies as an emergency resource. Hunt is an intriguing asset with skills that seem to match Laviolette’s system — the left-handed shooter has averaged over a point-per-game at the AHL level this year and marked five points (one goal, four assists) in only nine games with the St. Louis Blues. With Subban practicing again, and the possibility that both he and Josi return to the lineup as early as next week, it can be guaranteed that the defensive unit is staring down the barrel of further change. The question becomes: will that change involve a return to inconsistency for the Predators? 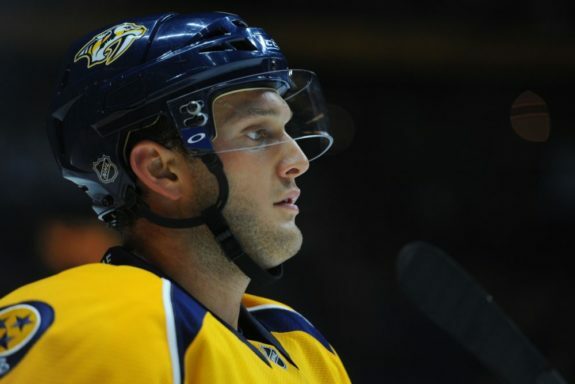 Or will the preseason promises of a Cup-contending team in Nashville begin to find its fangs?